Birthplace Earth Race Human Politics Freedom Religion Love Shirt. (Black, Medium) by Blue Sand Textiles at Fdccla. Hurry! Limited time offer. Offer valid only while supplies last. 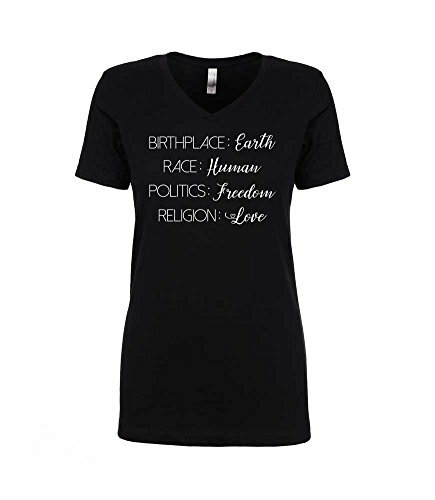 This super soft V-Neck Women's Fitted Tee is printed with ''Birthplace Earth Race Human Politics Freedom Religion Love'' in white across the front. This super soft V-Neck Women's Fitted Tee is printed with "Birthplace Earth Race Human Politics Freedom Religion Love" in white across the front. These shirts are very comfortable, and fit true to size. They have a nice stretch and are meant to have a snug fit, if you would like a more relaxed fit please order up one or two sizes. Please check chest measurements below to be sure. Small- Chest 30, Body Length 25.75 Medium- Chest 32, Body Length 26 Large- Chest 34, Body Length 26.75 XL- Chest 37, Body Length 27.25 XXL- Chest 40, Body Length 27.75 Care Instructions- Handwash or delicate cycle, inside out, on cold. Hang dry for best results. Do not iron on screen print. These shirts are made from pre-laundered fabric for reduced shrinkage. 60% Cotton/40% Polyester Blend, lightweight jersey. This Shirt Runs Small- Order Up A Size If You Would Like More Room & Order Up A Couple Sizes If You Would Like A Baggy Fit. This Is A Fitted Women's Shirt That Has A Nice Stretch. Super Cute and Comfy Tee perfect for Everyday, Casual Wear great paired with jeans or leggings. Hand wash or delicate cycle, inside out, on cold. Hang dry for best results. Tumble dry on low heat. If you have any questions about this product by Blue Sand Textiles, contact us by completing and submitting the form below. If you are looking for a specif part number, please include it with your message.